Fans of historical transportation will certainly find the story of the Union Depot in downtown St. Paul, MN fascinating. First opened in 1881, the station burned down in 1913. A new station, the current Union Depot, opened in 1923 and was fully completed in 1926. It had nine railroads and 282 daily train movements at its heyday in the Roaring ’20s. However, people change along with the times. A slow, steady decline based on emerging travel options led to a discontinuation of passenger rail service in 1971. Four decades later, Union Depot has re-emerged to great acclaim, and the newly renovated transportation hub, owned by Ramsey County Regional Railroad Authority, has state-of-the-art equipment to match. However, hints of past eras remain—a result of attentive work from systems integrator Tierney Brothers, based in Minneapolis, MN. From the start of the renovation, Ramsey County’s Regional Railroad Authority envisioned systems that maintained historic appearances but allowed modern functionality. Many of these challenges centered on historic cabinets that once displayed printed travel schedules and wayfinding information. These cabinets were renovated to house digital display screens, effectively transitioning Union Depot to dynamic signage solutions. 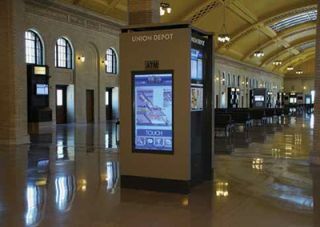 Six interactive kiosks powered by Tightrope Media Systems’ Carousel digital signage platform allow Union Depot travelers to explore information about Twin Cities restaurants, shopping centers, events, news, notifications, and more. Madsen and his colleagues worked with general contractor GC Mortenson and metal fabricator McGrath to build solutions in compliance with Union Depot’s renovation goals. Cable paths were concealed within the original wooden cabinets to keep everything neat and clean. Tierney chose Tightrope Media Systems’ Carousel digital signage platform, upgrading 22 historical cabinets for non-interactive channels. The Carousel deployment also includes six interactive kiosks that allow travelers to explore information about local restaurants, shopping centers, events, news, notifications, and more. Tierney worked with the Union Depot IT team to program the Carousel system and address networking challenges—a key challenge in the case of the latter. The migration to digital signage also centralizes the multi-modal facility’s bus, rail, taxi, and bike service schedules—including Metro Transit and Jefferson Bus Lines —into a common Union Depot-branded display. This ensures that all display signs maintain a consistent look and feel regardless of which transportation schedule is displayed, while simplifying the Carousel programming. The result is a successful intersection of historic appearances and modern functionality. Tierney has also installed AV systems in several conference rooms and banquet centers on the second and third floors of Union Depot. Tierney selected Panasonic PT-DZ680US DLP projectors, Crestron DigitalMedia and control systems, Da-Lite wide-format screens, QSC CX254 amplifiers, JBL Control ceiling speakers, Shure ULX wireless mics, and Polycom Sound Structure audio conferencing solutions for the various rooms. One conference room added a SMART Board for presentations. For Tierney, the project was ultimately satisfying given the success of the integration challenges across an historic property.